Peacock Room REMIX is organized by the Arthur M. Sackler Gallery. Darren Waterston’s installation Filthy Lucre, 2013–14, was created by the artist in collaboration with MASS MoCA, North Adams, Massachusetts. 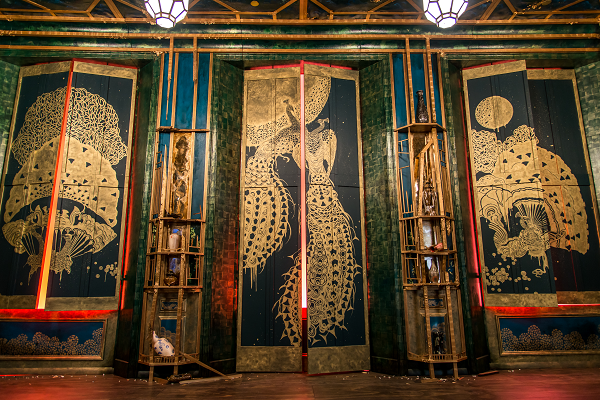 Experience Peacock Room REMIX: Darren Waterston's Filthy Lucre at the Freer|Sackler beginning May 16, 2015. The Smithsonian Institution (the “Smithsonian”) provides the content on this website (www.si.edu), other Smithsonian websites, and third-party sites on which it maintains a presence (“SI Websites”) in support of its mission for the “increase and diffusion of knowledge.” The Smithsonian invites visitors to use its online content for personal, educational and other non-commercial purposes. By using the SI Websites, you accept and agree to abide by the following terms. The Smithsonian is the owner of the compilation of content that is posted on the SI Websites, which consists of text, images, audio, video, databases, design, codes and software (“Content”). However, the Smithsonian does not necessarily own each component of the compilation. The Content that the Smithsonian makes available on the SI Websites may be owned by the Smithsonian, owned by others and used with their permission (such as user-generated content), or used in accordance with applicable law. Some Content is in the public domain and some Content is protected by third party rights, such as copyright, trademark, rights of publicity, privacy, and contractual restrictions. Smithsonian Content is identified as having “no known copyright restrictions” when the Smithsonian is unaware of any copyright restrictions on its use. This may mean that: (1) a copyright existed at one time but was not renewed, or the copyright may have expired, or the owner may have intentionally placed the Content into the public domain; or (2) the Content was never eligible for copyright protection because it was created by an employee of the United States as part of his or her official duties, or (3) there are no copyright markings or other indications on the Content to indicate that it was copyrighted or otherwise restricted; or (4) Smithsonian records do not indicate any evidence of copyright restrictions. These facts do not necessarily mean that the Content is in the public domain, but rather indicate that no evidence has been found to show that copyright restrictions apply. The Smithsonian endeavors to provide information that it possesses about the copyright status of the Content and to identify any other terms and conditions that may apply to use of the Content (such as trademark, rights of privacy or publicity, donor restrictions, etc. ); however, the Smithsonian can offer no guarantee or assurance that all pertinent information is provided or that the information is correct in each circumstance. It is your responsibility to determine what permission(s) you need in order to use the Content and, if necessary, to obtain such permission. If you have specific questions or information about Content on the SI Websites, please contact the appropriate Smithsonian museum or program that is associated with the Content. The Smithsonian welcomes you to make fair use of the Content as defined by copyright law.Information on United States copyright fair use law is available from the United States Copyright Office: http://www.copyright.gov/fls/fl102.html. Please note that you are responsible for determining whether your use is fair and for responding to any claims that may arise from your use. You must also cite and link to, when possible, the SI Website as the source of the Content. For commonly asked questions about use of Smithsonian content, see FAQs below. You may not use the Content for commercial purposes. This means that you may not sell the Content or sell materials, products or services that use and incorporate the Content, nor may you use the Content to promote or advertise products or services. If you wish to use the Content for any purpose beyond the permitted uses, such as a commercial use or publication (except as may be permitted by fair use under the copyright law), you must obtain prior written permission from the Smithsonian (or other owner of the Content as applicable). Send your permission request or other inquiries, including requests for higher quality formats, including high resolution digital images, to the Smithsonian museum or program that is associated with the Content you wish to use. Contact information for each museum and program are listed on the Rights, Restrictions and Security Contacts page of this website. If you are uncertain about what office to contact or are seeking permission to include the Content in a commercial product or other item of consumer merchandise, please contact the Office of Product Development and Licensing, rightsmanager@si.edu. If you are seeking to use the Content in a film or video product, or for general assistance with filming requests, please contact filmingrequests@si.edu. Many of the names, titles, trademarks, service marks, and logos that appear on the SI Websites are registered or common law (unregistered) marks of the Smithsonian. With the exception of fair use, you may not use the Smithsonian trademarks without prior written permission. Trademarks of third parties may also appear on the SI Websites from time to time. You agree that nothing on the SI Websites shall be construed as granting any license to use any Trademark displayed on the SI Websites without the express written permission of the owner of the trademark. By posting content, you are giving the Smithsonian and those authorized by the Smithsonian permission to use it for any educational, promotional or other standard museum purpose. You understand that the Smithsonian may monitor or review discussions, chats, postings, transmissions, bulletin boards or any other postings from time to time. You understand that the Smithsonian assumes no responsibility or liability arising from the posting of your content or for any error, defamation, libel, omission, obscenity, danger or inaccuracy contained in any posted information or from any failure or delay in removing such content. The Smithsonian reserves the right to monitor content or information provided by website visitors in its sole discretion, to edit or remove any content that, in the Smithsonian’s judgment, does not comply with the foregoing rules. The Smithsonian is not responsible for any user-generated content that is posted on the SI Websites or for any failure or delay in removing such content. If you have any complaints or objections to Content posted on the SI Websites because it was not properly credited or it was posted without permission and you are the copyright owner, please contact the Office of General Counsel, www.si.edu/OGC, with your contact information and a link to the relevant Content. The Smithsonian may link to third party sites which are not under the control of the Smithsonian. These links are provided as a convenience and for informational purposes only, and they do not indicate the Smithsonian’s endorsement, sponsorship of, or affiliation with the third party or content of the linked website, including any advertisements that may be posted. The Smithsonian has no control over, makes no representation or warranty and bears no responsibility for the accuracy, legality or content of the externally linked sites. Linking is an important feature that facilitates searching and making connections among websites. If you link to the SI Websites, you agree to present the link in a manner that does not give the impression that the Smithsonian endorses, whether expressly or implicitly, any products, services or opinions provided on your website and that the link contain a clearly written notice that the user is leaving your website and accessing another. The Content is provided “as is” without a warranty of any kind, either expressed or implied, including but not limited to the implied warranties of merchantability, fitness for a particular use, and/or non-infringement. The Smithsonian shall not be responsible or liable for any damage that may occur due to your use of SI Websites or downloading any Content from the SI Websites. May I put Smithsonian Content on my personal website, blog or my Facebook® (or other social networking) page? Comply with any other terms or restrictions that may be applicable to the Content. Is it an unauthorized use if the host of my website or blog adds advertising to my website or blog? I love the Smithsonian sunburst logo! May I use it on my website? No. You may not use the Smithsonian logo or other trademarks without the Smithsonian’s prior written permission. But what if I want use the Smithsonian logo as a link to the Smithsonian website? Even so, you need the Smithsonian’s prior written permission to use its logo or other trademarks for any purpose (other than fair use as defined by trademark law). For linking, please use a text link, not the logo. May I use Smithsonian Content on t-shirts that I plan to sell? No, this would be a commercial use. If you wish to make a commercial use, you must obtain prior written permission. Contact: rightsmanager@si.edu. If I find Smithsonian Content on a website such as the Flickr Commons and the Content is described as having “no known copyright restriction,” how may I use the Content? The phrase “no known copyright restriction” means that the Smithsonian has determined, to the best of its ability based on available information, that the Content is unlikely to be protected by copyright interests and, in all likelihood, is in the public domain. However, copyright is often difficult to determine with certainty, so the phrase is intended to say that the Smithsonian is unaware of any copyright restriction, but such restrictions may still exist. In addition, even if the Content is unrestricted from a copyright standpoint, there may be other considerations that would limit your use, such as rights of privacy or publicity of the individuals featured in the images, or contractual restrictions. For these reasons, the Smithsonian makes its content available for personal and non-commercial educational uses consistent with the principles of fair use. If you decide to use the Content for commercial or other purposes without undertaking to clear all rights, you will be responsible if someone else owns the rights and the owner objects to your use. How may I use Smithsonian Content in my research paper or other class work? How may I use Smithsonian Content in my lectures/lesson plans?